Sensually, visually, this is such a pleasing image. I love the textures: the reflective glass, the rich array of grainy greys, the dark velvety shadows. I love the strong, clear vertical lines holding it all together, the repetition of the many parallelograms in a variety of sizes and tones, the angles, the in-and-out concertinaing of the shallow space. I like the contrast of the organic accents: the curves and spirals and loops: dark against light, light against dark. As a purely abstract surface, this is a picture that satisfies me. It's delicious. I look, and look again. I become aware of the quiet. All is ready. The plates are gleaming, the serviettes stacked, the jugs for water are waiting to be filled, the condiments to be tasted. Two high chairs await their babies. "Who is greater? The one who sits at the table, or the one who serves?" Jesus asked. I think about people who serve in restaurants. The hundreds and hundreds of scurrying waiters all over the world in establishments big and small, the hot and bothered cooks, the weary moppers of counters and floors. I think of all the mothers in the world who shop, and cook, and serve, and clean. Day after day, year in, year out. As soon as they're done, they start again. Unsung heroes. Even when they complain a bit, they're still heroes. I think about the rich man who prepared a feast for his friends, and when all was ready, nobody came. I think about Mary and Martha... and Mary making the better choice. A bit unfair, Jesus, don't you think? Somebody's got to do the work? He smiles. He glances at the high chair, then back at me. Become as a little child, my dear. Come aside, and rest a while. I am here. I will serve you, with the bread of life and living water. All is ready. Erna Buber-deVilliers is a retired Art teacher who still has to learn how to do nothing. Hal Moran is a life-long resident of the St. Louis, Missouri area and now lives with his wife, Kathleen, in the suburb of St. Charles. Married for 30 years they have one daughter, who is married, and one granddaughter. Although Hal has taken numerous courses in photography, he is primarily self-taught. Having grown up with Tourette Syndrome and dyslexia, visual communication was of great importance to Hal in how he processed information educationally and spiritually. In his early adult years photography became his medium of choice in expressing his biblical worldview. Hal's primary focus and passion is encouraging others by capturing the gospel narrative in the natural world through photography. He also conducts workshops and seminars. Hal has exhibited both nationally and internationally, and his artwork is widely held privately. As a film-based photographer, Hal digitizes his images for printing with archival inks and paper in order to maintain the original capture. Who is greater is available as a 6”x 9” limited edition print. 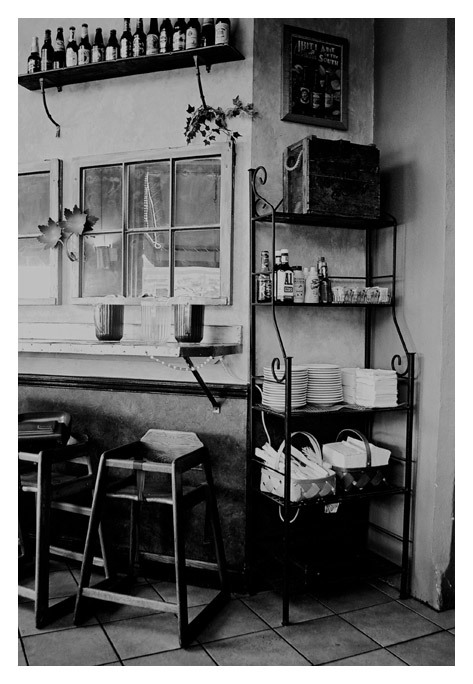 This image was captured at a downtown restaurant while visiting the town of Charlotte, NC. The servers' station was well stocked and prepared. All it needed was a few patrons.